Who is running for Governor, again? I meant to write this a few days ago. Anyways, BOR had this obnoxious little piece about the gubernatorial candidates. The piece mentioned six gubernatorial candidates (three being defied “on deck” and three as “long shots”). Mike Villarreal (a San Antonio State Rep), Kirk Watson (a Austin State Senator) and Bill White are the ones who are “on deck,” as BOR puts it. Rafael Anchia (a Dallas State Rep), Wendy Davis and Julian Castro are the ones who are less-likely, I suppose. I have a few comments on this. First, I cannot say that I am surprised that the Austinites have to throw a bone to one of their own. I really like Sen. Watson, for the record, and think he would make a good statewide candidate, but I cannot find any other site which validates this little factoid. However, I seem to remember a very-similar rumour in 2010, which turned out to be completely, totally and utterly false. Second, I really would not call Bill White “on-deck” for a gubernatorial run, or really anything in politics. Again, I don’t know where they’re getting this info, but even the adults in Houston political blogging haven’t been talking about this. Even if there is some movement about White’s candidacy, I would not venture to call his odds in an echelon above Sen Watson or Mayor Castro. Finally, most perplexing in my opinion, is how completely different these names are from the ones I’ve been hearing of recent in other blogs. Kuff has been talking about Cecile Richards, Henry Cisneros and Rodney Ellis, and BOR did not even touch upon it. I find this a little perplexing. I’ve had problems with BOR’s reliability in the past, and I generally will trust fellow Houstonians first and foremost, but that’s just me. Okay, goodnight. Soaking up everything that is Houston right now, leave for Austin on Friday. First off, I have not been writing much of recent. There are two reasons for this. First, nothing really goes on in local politics around Christmastime, but much more pressing, I have been on a vacation. I just got back to Boston yesterday, and after a stressful night (the airline lost my luggage), I have finally settled back into the swing of things. Fortunately, that means I will be back to my schedule of about 7-9 articles during the schoolweek, and one on Saturday. Now, for the fun, enter General Abbott. WFAA, the ABC affiliate for the metroplex, is running a story about our dear Attorney General, saying that he is telling big money donors that he is running for Governor. The sharks are officially in the water. Just like Staples and Patterson and Combs jumping on Dewhurst after they smelled the blood from the failed Senate bid, Abbott is biting Perry after his embarrassing quest for President. So, this sets off what I like to call the “midterm shuffle.” For this, I would like to talk about two categories: People & Titles. In the people department, we have Rick Perry, David Dewhurst, Greg Abbott, Jerry Patterson, Todd Staples, Susan Combs, George P. Bush, and probably a few more as the year goes on. In the title department, we have Governor, Lieutenant Governor, Attorney General, Land Commissioner, Agriculture Commissioner, and Comptroller. Perry is officially, unofficially running again in 2014. There is a rather humorous twitter page for the presumptive campaign here. Otherwise, there really is not very much legitimate literature on the Governor’s plans. Dewhurst is, however, officially officially running for re-election next year. Patterson & Staples are running against him. Meanwhile, Combs is still unofficially unofficially running for the position. The Agriculture Commissioner’s office and the Attorney General’s office looks vacant then, as does the Comptroller’s is Combs decides, indeed, to run. Last but certainly not least, George P. Bush is unofficially, officially running for Land Commissioner. If this is started to make your head hurt too, you’re in good company. Governor Perry recently skyped with the Koutze County cheerleaders, where he quoted the Bible to defend their religious signs, equating their struggle to the disciples of the New Testament. BOR makes a point of juxtaposing this with the recent memory of the Governor calling on “Christian warriors” to fight Obama and Satan attempting to limit religion in the public square. The rallying cry has now been the sign you see above, “If u [sic] don’t like it, leave! Cause we believe.” This seems to be the first defense of the neocon when trying to support dangerous nationalism or what not. However, that is not what this country is about. Freedom of religion means freedom FROM religion, which means the Government may not do anything to support one religion over another or religion over lack thereof. Governor Perry and his friends seem to discuss the atheists and the ACLU “imposing” their wills upon America, but this is simply not true. In a secular country, people can still pray individually and do as much public expression of religion in the private sphere. It is the theocrats who wish to “impose” their will upon America. I’ll level with y’all, I’m not an atheist. But I get quite uncomfortable when religion is discussed in a group setting, and it always angers me if that is a Government setting. So, my parting words, to the ladies of the Koutze High School Cheerleading Team and their advocates within Government: if you don’t like the system we have here–a separation of the church and the state–YOU can leave. You all can move to a true theocracy, like Iran! My roommate has an alarm that consistently goes off in the early morning, irrespective of whether he gets up or not. The alarm is a song that beginning with the audible word of “Craziness” before descending into a sub-par Chinese song that is unintelligible to me. Well, that seemed to be what last night’s debate was like. I keenly remember Sadler calling Cruz “crazy” a few times, and then the event drifted into gibberish and pedantic drek. The two did not seem to get to very much policy, which was somewhat disappointing, but traded quite a few ad hominems and other oddly placed insults, jabs, and gibes. In what I cannot overstate enough tarnished my respect for Paul Sadler, he took the bait and took offense to Ted Cruz calling him a “liberal”. This has always reminded me of the Seinfeld scene where Kramer accuses Jerry of being discriminatory against dentists. The fact is that Ted Cruz is simply calling his opponent by his political affiliation. It makes Sadler look quite weak when we runs away from honest labels like a scared, little mutt. If he had any real chutzpah, he would explain what it means to be a Liberal (e.g., have a heart like Roosevelt, Kennedy, Clinton) and why a Liberal would be good for our state. Instead, he legitimized Cruz’s preposterous insult by simply refuting it on face value. Jerry: I am not an anti-Denite! Yes, Paul, yes I do find it Liberal to be concerned with our deficits. The last true Liberal we had as President did exactly that, but I digress. With this stupid turn, the Democrats have taken the bait and lost their 9th Senate election in a row in Texas. This is Tilly, my yellow dog. She isn’t very bright but I would vote for her over quite a few candidates for political office this year. Some of these candidates have formidable Democratic opponents, but the common denominator is that I would vote for the Democrats in these elections even if it were a yellow dog. I endorse the incumbent, Barack H. Obama, for re-election. Yes, I support the President on most issues, but with Romney on the other end, it was a pretty easy choice. I endorse former State Representative Paul Sadler. As opposed to a few of the sorry fellas that the TXDEMs have put up over the years, I actually do really like Sadler. 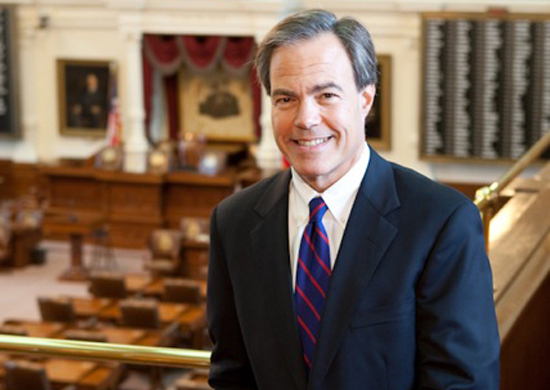 It does help, however, that he is running against the guy that makes Dewhurst look sane. I endorse the Democrat, Jim Dougherty. Congressman Poe, as much as he had previously garnered a good deal of respect from me, lost it all last term as he made fictitious statements about voter fraud, skirted on the edge of birtherism, and played the “Obama-is-an-anti-Israel-anti-semite” card, which I take very personally. I endorse the Democrat, James Cargas. In 2010, I had to pick Tilly because there were no opponents to Culberson. Culberson is my congressman, and such, we have had a very special relationship ever since his office blocked my email address when I was in the 9th grade. From making garbage up to try and destroy the METRORail, to more extremism, to only proposing one bill over the last few years, I hold a particularly disdain from the honorable Congressman from Texas, and such I am happy he has drawn good enough of an opponent in Cargas. I endorse the incumbent, Al Green. I endorse the Democrat, Tawana Cadien. Congressman McCaul, as the richest member of Congress, has done nothing to refute the presumption that he is out of touch, in fact he has exacerbated it. I endorse the honorable former Congressman, Nick Lampson, for reasons stated in previous posts. I endorse Tilly. The district formerly held by Chet Edwards, a Democrat, as late as 2010, is now held by Republican Bill Flores. Flores did not draw a Democratic opponent. I endorse the incumbent, Sheila Jackson Lee. I endorse Tilly, again. Congressman Olson is just as far right as Tom DeLay, and his Democratic opponent belongs to the LaRouche cult (I didn’t even know that still existed). I endorse the incumbent, Gene Green. I endorse the Democrat, Max Martin. He was the only Democrat to sign up for the primary that twelve Republicans duked it out for. That takes chutzpah. For further reference, I endorse all the Democrats in the Houston area running for the State Legislature. However, I try to endorse a few Republicans when it comes to county jobs. Stay tuned.